In 1996, during a meeting of the American Astronomical Society astronomer Peter Usher presented a usual paper titled “A new reading of Shakespeare’s Hamlet”. In the paper Usher argued that Hamlet was written as an allegory about competing cosmological models. It is always a little alarming whenever someone announces they’ve peered into Shakespeare’s mind and unlocked its secretes, but in this case Usher’s paper begged a very good question: what, if any influence did science have on Shakespeare’s work? Dan Falk tries to answer this question in his tour de force, The science of Shakespeare. Falk reminds us that,“William Shakespeare lived at a remarkable time—a period we now recognize as the first phase of the Scientific Revolution. New ideas were transforming Western thought, the medieval was giving way to the modern, and the work of a few key figures hinted at the brave new world to come: The methodical and rational Galileo, the skeptical Montaigne”. The obvious question is, did any of this have an impact on Shakespeare’s writing? If so can we find hints of scientific ideas in Elizabethan pop culture? From the very start Falk admits to be walking a thin line. It’s one thing to analyze Shakespeare’s work in order to form an opinion on what he might have thought; it is another to conjecture based on one’s own thoughts. That an astronomer thinks Hamlet is some sort of scientific thesis should gives us pause. Yet Falk is open to the idea that Shakespeare was indeed influenced by the events and people around him and that this influence is peppered through out the plays. Does Falk present a convincing argument? I think so. First, we have to admit that it is not unusual for a writer to be influenced by current events and public figures. Shakespeare would not have such a lasting impact on us if he had not commented on society. Yet this idea of science in Shakespeare shows us that there is more going on than just simple acknowledgment of the changing times. Drawing on new ideas and discoveries, Shakespeare may be telling us how they affected society. After all, his audience would have to have some basic understanding of them in order to understand his words. Falk makes his case by introducing us to some of history’s most compelling thinkers. Men like Thomas Digges, the publisher of the first English account of the “new astronomy” and who just happened to live in the same neighborhood as Shakespeare; Tycho Brahe, whose observatory-castle stood within sight of Elsinore and whose family crest happened to include the names “Rosencrans” and “Guildensteren (did you know that? I didn’t) and my favorite (I have to thank Falk for introducing him to me) Michel de Montaigne, a skeptical thinker whose motto Que sais-je? (What do I know), mirrors my own. Falk shows us how each of these men and others, in one way or another influenced Shakespeare’s work. And use of service none. This does not prove Shakespeare argued for a utopian society, but it does show us that he was reading and thinking about recent publications and events. As I read this I wondered if The Tempest was indeed a critical allegory to colonization, and if so, was it Montaigne who planted the seed of doubt in Shakespeare’s mind? Around 1610, Galileo’s book, The Starry Messenger was a hot topic in English intellectual society. The book sold out. Thomas Hobbes had a hard time getting his hands on a copy. Galileo’s observation of Jupiter’s four “satellites” showed that Copernicus’ model of a heliocentric universe just might be right after all. This had to be big news and to ignore it would be to ignore the changing views of our place in the universe. Shakespeare could have written a play about this had it not been controversial and a little boring for two hour play, but instead seems to have planted the idea in a convoluted scene in Cymbeline. In the scene, Posthumus, finds himself jailed. In his cell Posthumus has a dream in which four ghosts visit him and move around him in a circle. They call upon the god Jupiter to help him. Humm.. four satellites and the god Jupiter? This is either an odd coincidence or Shakespeare’s way of introducing his audience to idea of this discovery. Of course we will never know. Though the book is filled with more examples, some more convincing than others, Falk never makes the claim that these are proof that Shakespeare used science. We are left to form our own opinions. This is one of many reasons this is a compelling read. 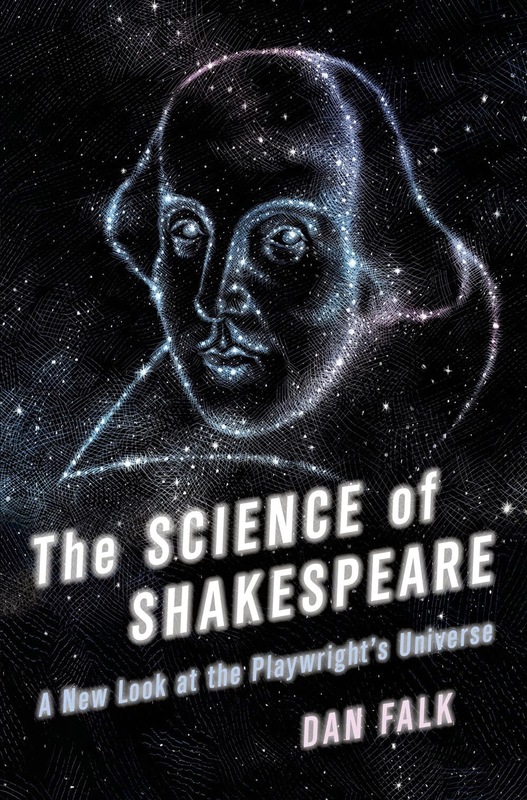 Falk explores many theories on Shakespeare and science, yet rarely comments on them. The one exception may be his agreement that Prospero may be based on Thomas Digges rather than John Dee. I do not agree, for the simple reason Dee was both a man of science and a magician who claimed to talk to the angel Uriel (just as Prospero talked to Ariel). If nothing else this is a wonderful look at the history of science and the men who brought about the scientific revolution. It had me questioning some of the modern assumptions about Shakespeare’s work. It just might be my choice for best read of 2014. I wonder though, what impact does Falk’s book have on the authorship question? Surely Digges’ or Montaigne’s work wasn’t as accessible as more common literature in Shakespeare’s time. And if Hobbes had a tough time getting a copy of The Starry Messenger, would the Bard have been able to get one? You know my thoughts on that silly argument, but I foresee certain people taking this up as a new banner. Falk dismisses these claims and does a good job of explaining how Shakespeare could have gotten his hands on these works. It is known Shakespeare and Digges’ son were friends, if I remember right they were in partnership at one time. So Shakespeare would have access to scientific books. His plays I mentioned were performed around the time the works were published. I should have mentioned that. We know that Hobbs wanted to buy one as he mentions this in a letter. Perhaps Shakespeare borrowed one. I am afraid Falk’s effort is a light-weight discussion of science in Shakespeare. The Shakespeare author corresponded with Brahe. The modern theorist of the atomic theory, Nicholas Hill, was his secretary. He was on familiar terms with Bruno, who propounded that the universe was infinite, the fiery stars endless, which got him burned at the stake, defiant to the last. Hence the discussion about stars as fire in Hamlet. The problem here is that we are not discussing the money-lender from Stratford whose greatest late-life triumph was suing the local apothecary for a few pounds. Edward de Vere was one of the best educated minds in the Renaissance era. He wrote the Shakespeare canon. It is practically his autobiography. A closing question which Falk never took on: why in the Shakespeare canon are NO celestial events mentioned that occurred after the year 1604–the year de Vere died? The invention of the telescope for celestial sighting? No. The moons of Jupiter? No, and don’t make me laugh with the forced analogy of four satellites in The Tempest. The phases of Venus? No. The exploded supernova in Cassiopeia? No. Retrograde Mars and its meaning? No. The heliocentric planetary system? No. It had nothing to do with controversial subjects about the ecliptic. The author was dead by then. Here is a much better discussion that doesn’t take a book: Searching for Shakespeare in the Stars by Eric Lewin Altschuler, Physics, Oct. 23, 1998. Don’t believe everything you read yesterday and especially not by people who have for years. My remarks were general, based on the presence or by the same token lack of certain scientific material in the Shakespeare canon. 1604 was the stopping point for new scientific knowledge, just as it was for the issuance of new plays. It is certainly plausible that someone who was interested and a writer could accumulate a large amount of current astronomy and geological information and incorporate it into his work. In the particular case of the Stratfordian William Shakspere (never referred to himself as Shakespeare, long-a pronunciation, never signed as that, never was recorded under that phonetic identification) there is actually no evidence even that he could write. The supposition of his literary talent and career is based on what Ben Jonson wrote in the First Folio. Ben Jonson hated Shakspere”s guts, as shown in On Poet-Ape written when Shakspere died in 1616. His plays characterized Shakspere as a knave and a fool. This combination of events and evidence leads me to feel that the First Folio introductory material was a ruse to displace the identity of the Shakespeare pseudonym onto the posthumous life of a completely unrelated individual who had a (real) name similar to the pseudonym. Once the confusion caused the beginning of a myth, it became fixed in legend and invested interests do not wish to have it tampered with. William, I am sorry you missed an earlier post in which I talked about the “authorship” question, and asked for polite discussion. This post is about a book I had just read and had nothing to do with the authorship of the plays. I am assuming you came here to jerk my chain. If so, you have failed. That there are others who think someone besides Shakespeare wrote the plays is no concern of mine, unless someone can show hard evidence to the contrary. What you have provided is gibberish and insulting. I will not engage in a circle jerk but will defend my home, which you came to uninvited to and then insulted me. Autobiographical? No, the majority of the plays are based on older works. Works that are still in print and can be named. One thing is clear, Shakespeare may be a brilliant writer, but he is not original. As for anything mentioned after 1604? Well, why isn’t anything mentioned in the plays about new discoveries before 1604 besides Hamlet? Is this proof of someone else writing the play? No. We can ask ourselves the same question about writers today. Many great scientific discoveries are being made, yet pop culture rarely mentions them?. Why we do not see these discoveries in Shakespeare’s plays is the same reason we do not seem them mentioned today. Have you read Post-Ape by Johnson? In it he does seem to express disdain for Shakespeare..Shakespeare the playwright. May I suggest, the next time you show up on someone’s blog, show a little more tact, and use polite speech. My remarks are not in the least directed as personal insults to you but toward the current blind assumption that the Shakespeare person writing so knowledgeably on scientific advances of his time was a money-lender from Stratford and that he somehow got his knowledge from casually reading what were then rare and expensive books available only to a few elite aristocrats and their sponsored retainers in the arts and sciences. Falk made this critical error as did you, in trusting his assumptions about the author of the Shakespeare canon. My apologies for that misunderstanding. To take up your substantive question, why are there no indications of Shakespeare mentioning discoveries before Hamlet. There are numerous mentions of special knowledge in the earlier plays. (Hamlet by the way was first staged in about 1588, long before the currently assumed date of 1603-4, indicating that the traditionally attributed author could not have been the playwright of the greatest play since the Greeks fresh out of Stratford.) Some of these mentions are: 1) 2HIV, II.l–Ursa Major is mentioned to determine the hour of the night. A bright fixed star west of the pole at 1 AM is mentioned, during Nov. This description fits what had been seen in Cassiopeia in Nov. 1572. Shakspere was eight years old then. 2) Hamlet mentions a comet visible in Europe. A comet is mentioned in 1HVI and also in TofS, dated to 1578 in an early version of the play. 3) Troilus and Cressida mentions geomagnetism, as does Hamlet. de Vere was a friend of William Gilbert who discovered it in 1600. –Hamlet’s famous phrase is “mad, north by northwest”, suggesting the direction of a compass needle moved by magnetic north. 4) In 2HIV, II.4.286– Saturn and Venus are noted as being in conjunction. 5) In 1HVI, I.2.1-2, there is the noting of Mars–“Mars his time moving even as in the heavens. So in the Earth, to this day is not known.” The orbit was not known then and Keppler did not note this puzzle until 1609, the retrograde pattern of Mars.6) 3HVI, II.1.25-32 mentions pachelia, mock suns in some detail, in the conversation between Edward and Richard. 7) MSND II.2.61 talks about the brightness of Venus 8) AWTEW II.1.166-7 mentions Venus as becoming the evening star after being the morning star. So there is considerable celestial knowledge discussed as the movement of the spheres became better known.Nothign after 1604, espcially not sunspots and the valleys and hills of the moon, which were a sensation after the use of the telescope. And I must disagree that Jonson’s excoriation of Shakspere in On Poet-Ape had to do with his being a playwright. That is incorrect.”To a little wealth, and credit in the scene, he takes up all, makes each man’s wit his own: and told of this he slights it. Tut, such crimes the sluggish gaping auditor devours; he marks not whose ’twas first: and after-times may judge it to be his, as well as ours.” He is speaking not of a playwright but a thief of copybooks. Finally, it is true that the Shakespeare author used traditional plots, most not available in English but from the Continent in foreign languages, and then he introduced personal touches for the entertainment of the Court and to vent his personal vengeance, such as with Polonius and his model, the hated father in law Lord Burghley. If a commoner did that, he would have been jailed or worse. So i feel that general defenses of the Stratford model will not do. The facts do not support such an assumption. Revolutionary scientific knowledge in the canon least of all. The more I read of and about Shakespeare, the less I seem to know. Over the years I’ve enjoyed an insightful essay about the Elizabethan world picture and contemporary ideas about the great chain of being (by Tillyard? ), intriguing cosmological speculation in ‘Hamlet’s Mill’, a recent persuasive Guardian essay about the likely contribution made by the editor of, I believe, the First Folio; in addition, the Jupiter scene in ‘Cymbeline’, so much like a masque and different in language and tone from most of the rest of the play, seems to me to be by S’s collaborator rather than himself. And the similar phrases in Montaigne and ‘The Tempest’ prompts me to re-read a fine study called ‘The Dream of Prospero’, about the sources of S’s late play. The point of all this rambling on my part (it’s early morning for me!) is that there is so much of the author’s life and times and milieu that I remain ignorant of that I must rely on more informed opinions such as your own: if you say such and such is likely I’m very willing to entertain the thought! No writer is isolated from his or her times, and S — a voracious reader we must accept — certainly holds a mirror up to his. Thank you Chris. Your observation about Cymbeline is well taken. It frustrates me to no end that I do not have access to the First Folio. Can you believe, here in America getting one’s hand on a copy is a challenge. I would love to posses various versions of the plays so I can study the differences. It could very well be that this odd scene is an addition, though why someone would do this is a mystery. We do know the language of the plays changed over the years. Falk mentions a few lines in Hamlet that I have never seen. The Dream of Prospero is on my list of reads. I must move it up. Right now I am trying to get through a book titled “Coming of Age in Shakespeare” by Marjorie Garber. She is said to be one of the foremost American authorities on Shakespeare, but I have admit, even she makes some rather bold assumptions. I like to dip my toe into Shakespeare studies now and again, even if I rarely feel any wiser. I would recommend either the Yale Univ. Press or Norton facsimiles. The latter takes the best print version of each of the plays. The Yale copy follows their Elizabeth Club of Yale copy, which is excellent. It is available on the Internet for a low price. … in academic reference libraries? Sadly I don’t have access to these. Maybe Project Gutenberg provides texts? When we get home in a couple of days I’ll find a link to that Guardian Review article from a couple of months ago. That Guardian article is by Saul Frampton, who’s writing a book about who might have edited the First Folio: his candidate is John Florio, “an accomplished linguist and lexicographer” according to Frampton, and he makes a strong case. Thank you William and Chris for tips. I will take a look at the Norton edition. I have the Yale complete edition. It was my first purchase and I used to consult it, but it being huge and the font small, it’s more of a show piece, but perhaps i should look at it more closely. Yes, the various incarnations are a bit of a bother. I see discrepancies in the translations rather than whole lines or scenes deleted or added. This is why I would love to have a personal copy of the Folio. The ones I have seen available for sale are of poor quality. Amazon has one for sale for $103.00, but is photo copy with poor binding. I have Arden and Folgers, but Falk (using footnotes) says he consulted Arden and one I had not heard of (of course I cannot find the name now. One of the many reasons for a second read) as well as the Folio. I have access to digital academic libraries, never thought of look in them for copies of Shakespeare’s work, only because I hate to have to print them out. But it may be worth looking at. Darn it, Christ now I want both the folio and the quartos. Guess I better look at the Early English Books Online. Thanks for the tip and the Guardian link. Neverending, isn’t it? If only life was like that … or perhaps not.